On December 1, 1938, The Arizona Daily Star ran the story, “Nazis Order Secrecy as to Number Killed by their Policies.” In the matter of four short years, large-scale persecution escalated to complete annihilation, as the American people were made aware that “Nazis Seek to Slay All Jews in Europe Now.” These articles represent only a small fraction of the thousands of media reports that came out during World War II. Still, Americans today look back on the events of the Holocaust and wonder how we could have missed the warning signs that violence in Europe was imminent. Additionally, we question why we did not take the necessary steps to mitigate and end the atrocities once they became obvious. Today, we are seeing similar warning signs of mass atrocities, ethnic cleansing, and genocide in countries such as South Sudan and Burma. How can we work to ensure that we do not make the same mistake that past generations have made by ignoring the warning signs? How can the average person take action to prevent another genocide? In addition to supporting on-the-ground actors, the most important step that Americans can take to prevent and respond to atrocities in the modern era is to support legislation that ensures our government does not ignore its commitment to human rights. One such policy is the Elie Wiesel Genocide and Atrocity Prevention Act (S. 1158, H.R. 3030). Named after Nobel laureate, Holocaust survivor, activist, and author Elie Wiesel. The Congressional bill that bears his name seeks to do just that. 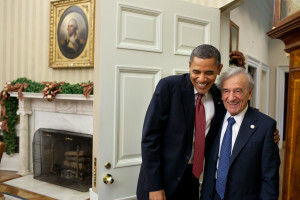 By creating a Mass Atrocities Task Force, improving Foreign Service Officer training, and institutionalizing the Complex Crises Fund to provide timely funding for rapidly emerging atrocity issues, the Elie Wiesel Genocide and Atrocities Prevention Act (GAPA) will bolster the ability of the U.S. to contribute to ending and preventing genocide and mass atrocities wherever they occur. The Mass Atrocities Task Force, modeled after today’s Atrocities Prevention Board (APB), would meet regularly to strategically determine a whole-of-government strategy to prevent and respond to emerging atrocities in at-risk countries. Since its inception in 2012, the APB has repeatedly proven its importance in the genocide prevention field. For example, through careful risk assessment and broad diplomatic engagement, the APB successfully helped limit violence in Burundi. In this instance, as well as in the Central African Republic and Jordan, APB processes have shown to be strategic and efficient in ensuring that genocide will no longer be ignored by the U.S. government. As an activist and champion of human rights advocacy, Elie Wiesel worked his entire adult life to combat violence against civilians. You can support this landmark legislation today: Sign and share our petition. Ready to take the next step? From calling Congress to writing an op-ed, you can make a difference. For more ways to get involved and make your voice heard, check out our website! Casey Bush is the Fundraising and Development Coordinator on the Managing Committee of STAND. As a senior studying History and Holocaust and Genocide Studies at Clark University in Worcester, Massachusetts, Casey is writing her undergraduate thesis on individual forgiveness and its effects on a post-Holocaust world. This entry was posted in Uncategorized and tagged Complex Crises Fund, Elie Wiesel, Foreign Service Officers, GAPA, genocide, holocaust, Nobel peace prize. Bookmark the permalink.